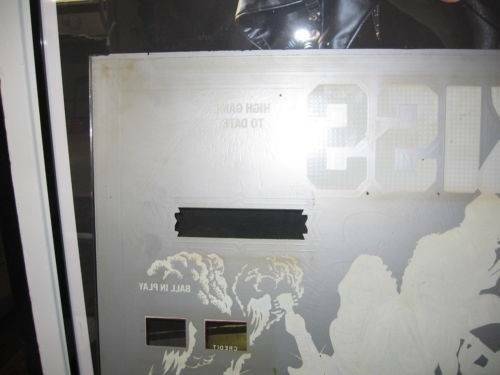 » Forum » All Pinball » KISS Signed Backglass. Worth The Purchase? » KISS Signed Backglass. Worth The Purchase? KISS Signed Backglass. Worth The Purchase? 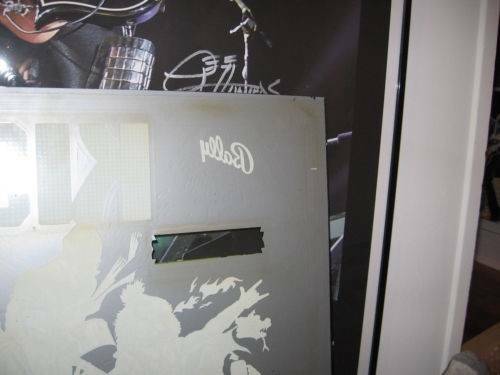 I came across a 1979 Bally KISS German backglass autographed by Gene Simmons, Peter Criss and Ace Frehley on Ebay and I was wondering if you guys think it's worth the purchase. It's already been relisted on Ebay. The first time it was listed for $1,400. 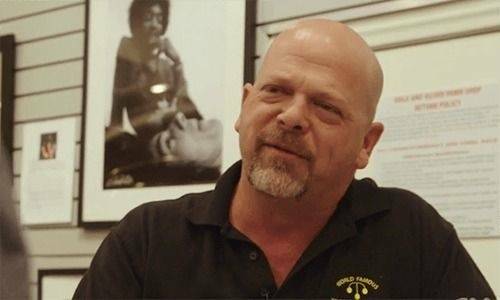 He also doesn't mention the condition of the backglass. Check it out below and let me know what you guys think! I'd buy it if I had a Bally KISS, but not for $1300. If it had all four original members I could see maybe $900, but with only three I'd say more like $700. I was thinking it was worth around $700 too. Is it worth more or less because it's a German KISS backglass? Say you were going to put it on an American machine. 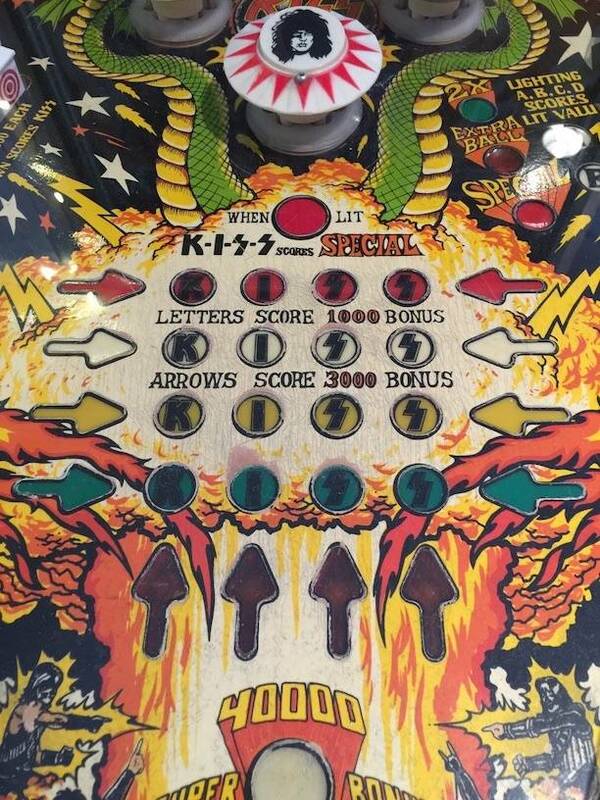 It doesn't have the original KISS S-rune, which I think the original KISS logo is pretty cool. The German glass makes it more rare in America, I think it is worth the asking price, very tough to get the original line up with proof of them signing it. Looks legit. kingpin22 Thanks for the info! but with only three I'd say more like $700. Agree! The fact he has 3 signatures and it's the German version I would go $700 unless it's a NOS glass. If NOS then maybe 900 (tops). Also, the way he has it stored would concern me! Is there any type of cushion between the wood and glass??? If not then you can expect the the wood has scratched the back side and, more than likely, left rub marks/scratches on the front side. I would ask the seller to take pictures of both the front and back of the glass outside of the crate he built for it! Lastly, there are still a lot of KISS fans out there and they still buy a lot of stuff, if this was a good deal the glass would be sold already! Plus Paul Stanley is still alive and makes plenty of appearances. If you really wanted that 4th signature, you could make it happen. It would not be worth $250 to me, but to each, his own. I agree with you. If it was NOS, I wouldn't mind paying $900, depending on the condition. The weird thing is, the seller has not responded to my question regarding the condition. He also didn't specify an item condition in the listing which I thought was weird. 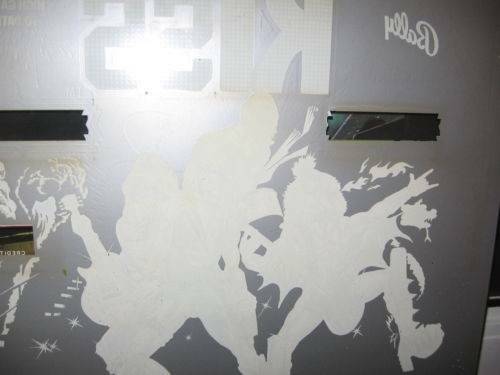 If you take a look at the player area on the backglass, it looks like you can see bubblewrap on the other side behind the backglass which is good but again, I couldn't agree more, if this thing was worth it, it would've been sold already! Without a doubt! You would definitely want to get that last signature. You'd have to get it for the right price to make it worth hunting Paul Stanley down. Telling by the votes on the poll, not too many people think it would be either! As a Kiss fan, I know how difficult it is to get autographs like this- Consider carrying this big piece of glass around (like a concert, for example), then trying to get them to pose for a picture while it's being signed. The thing with this glass is not only the signatures, but the ability to authenticate these signatures beyond someone just telling you they had it signed. There's no doubting the authenticity when you see pics of the guys signing it. The only thing that could have made this better is if they were in makeup. Problem with asking on this forum is most aren't true Kiss fans, and this is a Kiss fan question, not a pinball collector question. 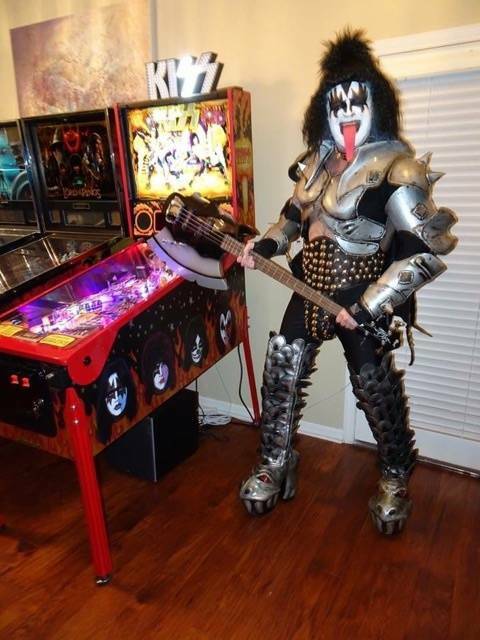 As a Kiss fan and pinball guy, I think this glass is over the top, but that's just me. I have a signed 1979 backglass, non-german, with Ace and Peter's signature in mint condition. The reason I don't have Gene and Paul? I haven't wanted to lug it to a concert and around a venue and risk breaking it. Imagine what it took for this guy to get this done, and the price seems like it's reasonable and perhaps you could score it for an offer. So which Kiss member is your avatar? LOL! I have a signed 1979 backglass, non-german, with Ace and Peter's signature in mint condition. khabbi Much appreciated for the $.02! I'm definitely interested in the backglass but I haven't been able to get a response from the seller at all on any of my questions or concerns. It makes it very difficult to want to buy from them. If you ever want to sell your non-german backglass with Ace and Peter's signature, please contact me. I'd be more than happy to entertain what you would be asking for it. Even though you have a picture showing them signing it, how do you know it's not someone else's back glass or pictures? Fakes can be made. Without an expert checking the signatures I wouldn't buy it. Without an expert checking the signatures I wouldn't buy it. "I have a buddy of mine who is an expert at checking signatures. Mind if I give him a call?" As someone who has several of Paul's, Gene's, Peter's & Ace's signatures done in person, I can tell you IMHO those signatures on the glass are not fakes. Even though you have a picture showing them signing it, how do you know it's not someone else's back glass or pictures? Fakes can be made. fishmanrob This is true. Although it really does look like Peter and Ace are signing the one that is for sale. It's a little harder to tell with the picture of Gene because it's so far away and I don't think it's in the same wooden case. With the picture of Ace, you can't see the KISS letters, so that doesn't help at all. All I can tell is that he is signing around the same area as the one for sale. vdojaq I would have to agree with you. They look like the same signatures that I have on my Destroyer album. I've acquired a few pictures of the back of the backglass from the seller. Frankly, i'm a little disappointed. I thought it would've been a little nicer and have less flakes/holes. Let me know what you guys think! Yeah I could see how those 5 teeny tiny little pinholes on an otherwise perfect 40-year old backglass would sour you on this item. I don't think that's all that bad, quite frankly. Not perfect, but better than I've seen in a lot of 40 year old backglasses. I've looked at a lot of 80's backglasses in my day, and I wouldn't be quick to turn this one away based on what I've seen out there. Agree with the others, for a glass of this age it's a nice glass!! Obviously it was used but again it's in very nice shape! One thing to keep in mind is shipping and temperature changes. It's winter in the northern hemisphere. If that goes from a warm shipping office into a freezing cold trailer on it's way to you all the paint might come right off the glass. Sorry for the mild hijack, I have a back glass print that is signed by all four guys back-in-the-day. One member wrote a personalized message. It's in excellent condition and I've always been curious as to an approximate value. Any reckons? Wow. That would not be good. Much appreciated for the info! yeoldpinplayer Is there any way to prevent that from happening? I kind of agree, I've seen some that are pretty messed up. That backglass really looks in excellent shape for it's age. If you're a huge KISS fan than maybe it's worth the asking price to you and just ignore what anyone else says. But if you ask me in general what it's worth, I'm sticking with my $700 number. There are lots of signed back glasses with all/some signatures so they are not super rare. Condition is important so $700-$1000 is reasonable. pickle How much do you think an American version in the same condition signed by all/some members would be worth? Haha, here's a pic of me on Halloween.. Crazy, right? khabbi That is pretty epic! Nice LOTR pin. I've worked with Sean Astin (Samwise). He's a pretty cool guy. tempest That is a really good point. Definitely something to keep in mind. Would you know, roughly, how much PS would charge for a signature? I recently tuned back into the KISS thing while rebuilding my record collection. One thing for sure is that KISS fans can be rabid, especially regarding collectables. 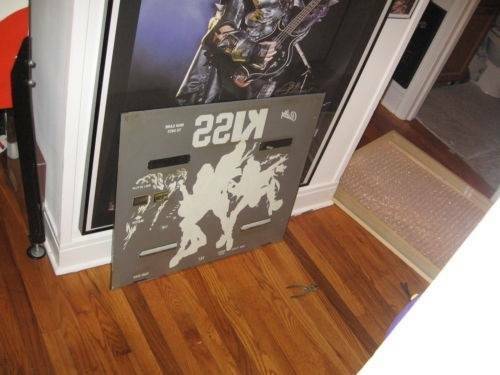 If it's already done a round on EBAY I can all but guarantee that gobs of KISS fans that regularly pay crazy prices for the right piece have already looked at this and passed on it so it's a matter of whether or not it's worth it to you. If it was some super desirable piece at even an unreasonable price it would be gone. They're a fickle bunch, 1300 for a signed backglass no, 300 for an unopened Kissopoly game or 150 for a spiral notebook from the 80's? ...All day, every day. I have some old school KISS collectibles including the Bally machine. It was at one time a "grail" collectible for diehards. Don't imagine that has changed much.Even raggedy ones are priced ridiculously. Autos don't mean much to me unless I was there. Would be a pain to lug around to get signed. That glass actually looks pretty good. I would prefer a normal version though. Hard to say what the "real" value is. Good point....I forgot the one in question is the German version so it is more rare than the US version but I don't think it adds a lot of value. So $700-$1000 is really a steal if it is in excellent condition. Figure it would cost $250 or more to get each signature plus the value of the back glass. For the ultimate collector that wanted both versions is who this woul appeal to. The average person prefers the US version. A signed US version should be worth $700-$1000 easily if it's in excellent condition. It really depends how bad someone wants it. There are many signed back glasses so it is not rare which hurts the value a little. The Bally table is why I even joined here! I was looking to buy one! I've heard something to the tune of $500.00 I would never pay for an autograph! 20 years ago you didn't pay for autographs. But autographs have become a business. Hardly anyone signs anything for free anymore. Back in the day bands had release parties at local record stores and would meet the fans to promote a new album...hardly happens anymore. Can anyone tell wether or not it is an IPB reproduction or an original from 1979? The IPB repops have not been around that long....looking at the wear and typical light bulb burn I suspect it's an original...I am not sure if there is any dead give away to tell if it is an IPB. The IPB playfield has a couple differences so easy to tell on those. Is there any way to prevent that from happening? I would ask in the restoration area. Sealing with triple thick would be my guess but someone must know for sure. I read somewhere that a real Bally backglass has about 1/8" of clear glass around the perimeter while the IPB reproduction has the grey backing all the way to the edges. It looks like the right side on the German one has about 1/8" of clear glass around the perimeter but the top looks like it goes all the way to the edges. Seeing as how the IPB reproductions were done about 10 years ago, I'm having to think it's an original. The seller never answered me on that specific question. You can buy a shipping box designed for backglasses from CPR. They might have info on their site about avoiding delamination too. Bonus question! I have an early production number 22 (http://www.ipsnd.net/details.aspx?id=50128) 1979 Bally KISS pinball machine with an original playfield. I've noticed that the sales flyers and a lot of the playfields I see online are different than mine. 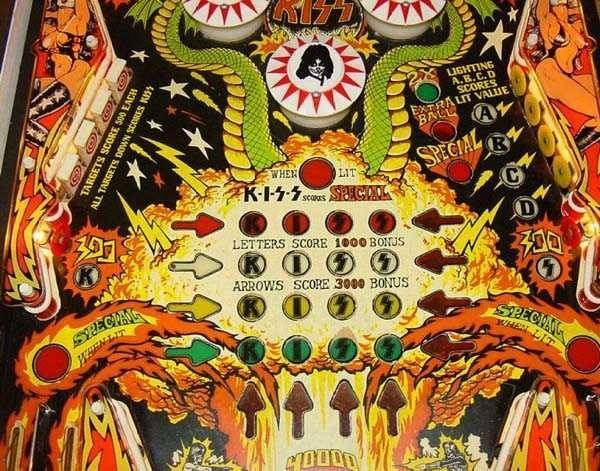 On mine, the arrows on the left and right are the same color as the KISS spelled out on the playfield. Notice how on Image B the arrows on the right side are orange/red. I was wondering if anyone knew why there is a difference between the playfield arrow colors. At IPDB the photos of the plastic playfield have color matched inserts. http://www.ipdb.org/showpic.pl?id=1386&picno=11990 I don't know if that's a coincidence or not. Hm. That is strange. I've seen those pictures on IPDB before but I never really looked at the image title and I don't know how to get ahold of the person who submitted those photos to IPDB. 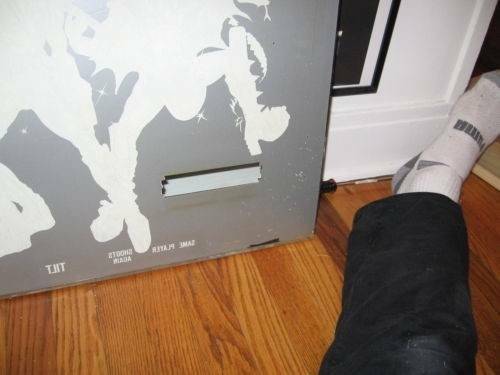 Is the entire playfield in that picture suppose to be made out of plastic? The bottom side of it sure makes it look like plastic (http://www.ipdb.org/showpic.pl?id=1386&picno=11991&zoom=1). I know mines not made out of plastic. When I google "plastic playfield" the only things that come up are the plastic sets for playfields. Not playfields that are made out of plastic, so I don't understand.